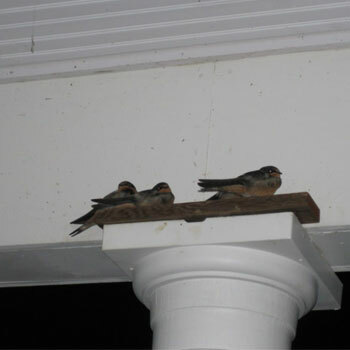 A Barn Swallow nest was built on a board on top of a post on the inside of our front porch. The favorite watch spot of the parent birds was the corner of the gutter just outside the edge of the porch. The gutter corner is where they spent much of their time keeping a watchful eye on their nest site. 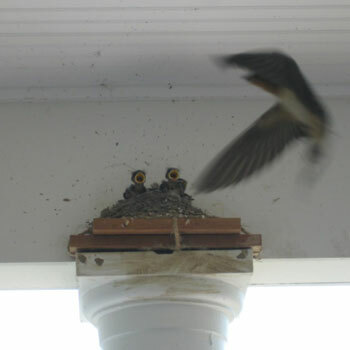 One parent would sit on one of the porch lights and sing to the other bird while she built the nest. 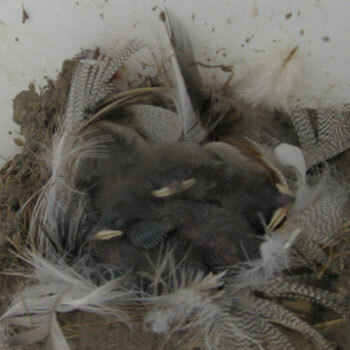 Starting at the end of May, we tried to discourage the birds for about two weeks: Played loud music, scared them away at night by yelling out the front door, removed the beginnings of the nest and then gave up, figuring they really needed someplace to lay their eggs. They were VERY persistent and finally triumphed over us humans completely! 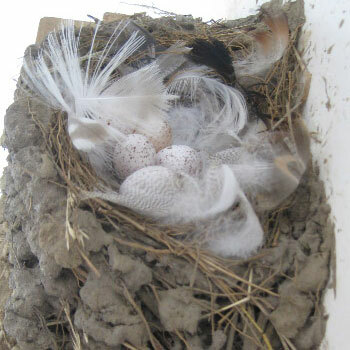 The nest began with 5 eggs. The parents took turns sitting on the nest when the eggs were incubating. Once the eggs hatched the parents took turns feeding the chicks and carrying away the encapsulated bird poop. Every time we went out our front door, one or both of them would make a lot of noise and dive bomb our heads but they never actually hit us. Eventually the nest got too small for everyone to fit, so the parents moved to the neighboring post for a while. Then all 4 nestlings got too big, and then they were gone. Because of them, we didn’t have a single moth fly in through the front door of our house. That was the first year moths had not been a problem collecting at our porch lights. This year we built them [I named them Sonny and Cher] a nest-box, they had a similar number of chicks, and one day when I came out of my garage to do some gardening, I counted about 14 barn swallows lined up along the garage gutter singing away, not at all concerned that I was standing there talking to them! …and moths are no longer a problem for us!